Oklahoma is 3-2 against the Cowboys winning by an average margin of victory of 6 points per game. The Sooners are coming off an emotional 30-29 victory over TCU last week in Norman, a game in which the team saw their starting quarterback (Baker Mayfield) leave with an injury. 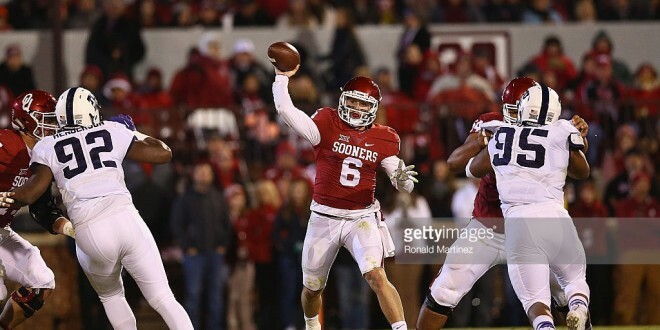 Mayfield has stated he will play in the game and the Sooners will need him to pull off the road victory. On the year, Oklahoma is averaging 44.6 points per game and is averaging 544 total yards of offense per game (225 rushing, 319 passing). Mayfield has been the main reason why the team has had great success moving the football against defenses and gives the offense big play capability on every play. On the season, Mayfield has completed 68.7% of his passes for 3,209 yards with 33 touchdowns and 5 interceptions. Since the loss to Texas, Mayfield has been solid in his decision making and uses every progression in the vertical passing attack. Over the last four games, Mayfield has thrown for 12 touchdowns and one interception. The Sooners are loaded at the skill positions with running backs Samaje Perine and Joe Mixon along with one of the best wide receivers groups in the nation (Sterling Shepard, DeDe Westbrook and Durron Neal). Perine leads the team with 1,160 yards averaging 5.9 yards per carry with 13 touchdowns while Mixon has added 613 yards on the ground with 5 scores. Shepard, Westbrook and Neal are a speedy group of receivers that will attack the Cowboys secondary on Saturday night and put pressure on the Cowboys to defend the whole field. On the year, the trio has combined for 151 receptions for 2,267 yards with 17 touchdowns. The Sooners have allowed 20.5 points per game and will be challenged by a balanced offensive attack by the Cowboys. Oklahoma has given up 150 rushing yards per game and is yielding 190 passing yards per game to their opponents. Turnovers will be critical to the road victory and the team is +8 in turnover margin entering this game. Linebacker Dominique Alexander (88 total tackles) and Eric Striker (7.5 sacks) lead one of the best units in the nation as they can run from sideline to sideline to make plays. Oklahoma will want to pressure Oklahoma State quarterback Mason Rudolph into quick decisions and short throws underneath coverage. On the year, the defense has recorded 37 sacks and will look too blitz early on to dictate the tempo of the game. If Oklahoma can make the Cowboys one dimensional the Sooners will have the advantage with their defense. Over the last four games, the team has allowed 117 rushing yards per game. The Cowboys will look to start fast playing at home and put the pressure on the Sooners to respond. The Cowboys are averaging 42.8 points per game and have one of the most prolific passing offenses in the nation averaging 360 passing yards per game. The Cowboys have relied on a dual quarterback system with Mason Rudolph (pocket passer) and JW Walsh (running quarterback). Rudolph has completed 63.1% of his passes for 3,591 yards with 21 touchdowns and 8 interceptions. Walsh is the more experienced quarterback (last year’s starter/injured) and can make plays both running or passing. He has thrown for 11 touchdowns with no interceptions and has rushed for 11 scores on the ground in the read option attack. Both quarterbacks keep opposing defenses guessing and give the Cowboys multiple options in their offensive scheme. Wide receiver James Washington is one of the most explosive players in college football and has the ability to take over a game. 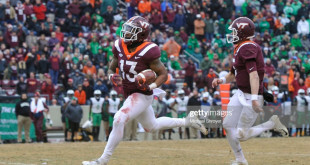 On the year, Washington has 45 receptions for 908 yards with 9 touchdowns while teammate David Glidden has added 50 receptions for 783 yards with 3 touchdowns. In order to get the home win, the Cowboys must be able to run the football against Oklahoma and not become dependent on the passing attack on each and every play. Oklahoma State is rushing for 132 yards per game and head coach Mike Gundy must be able to get running back Chris Carson involved in the game plan early on. Carson leads the team with 466 rushing yards averaging 4.0 yards per carry with 4 touchdowns. Oklahoma State has had a “bend but don’t break” type of defense that was exploited by the Baylor Bears last weekend in Stillwater. The group allowed over 700 yards of total offense and must do a better job in stopping the run this Saturday. On the year, the team is giving up 26.4 points per game and is allowing 170 rushing yards per game (over 300 last week to Baylor) along with 250 passing yards per game. In order to get the victory the Cowboys must force the Oklahoma offense to methodically work down the field on time consuming drives and force field goals instead of touchdowns in the red zone. Oklahoma State has been very opportunistic this year and is +15 in turnover margin (+13 at home) and must force turnovers to get momentum against the Sooners. Oklahoma State has recorded 36 sacks as a unit with defensive end Emmanuel Ogbah leading the team with 12. In the last four games, the Cowboys have allowed 370 passing yards per game to their opponents. Listen to Joe’s show on Yahoo Sports Radio every Saturday morning from 10-11am EST at www.streamysr.com. Joseph Lisi a former ABC Sports college football researcher, is the owner of www.GOFORTHE2.COM. He is a member if the FWAA (Football Writers Association Of America),Maxwell Football Club and is currently the content editor at www.2FiveSports.com.He contributes regularly to www.Sid-Rosenberg.com and has been a featured guest every Tuesday night from 10:30-11:30pm EST on Yahoo Sports Radio With Ken Thomson(www.sportsxradio.com). Joe has been featured on the FNTSY Sports Network and The Sid Rosenberg Sports Radio Show 640AM Sports (South Florida). You can follow him on Twitter: @Goforthe2. Joe has a weekly radio show on www.blogtalkradio.com with former Georgia Bulldogs WR Corey Allen called: THE NCAA WEEKLY BLITZ.